HONOLULU – Maui ranchers joined entomologists from the Hawaii Department of Agriculture (HDOA) at Haleakala Ranch this afternoon to release a biological control insect that will help to control the invasive fireweed which is highly toxic to cattle and horses. More than 13 years of research preceded today’s release of the Madagascan fireweed moth, Secusio extensa (Arctiidae). 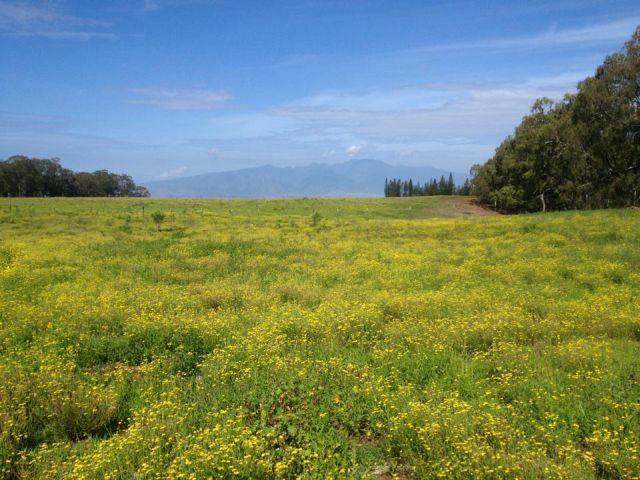 It is the state’s best hope of controlling the Madagascar fireweed that has taken over massive areas of Hawaii pasturelands. Today, HDOA released about 50 moths and 500 larvae (caterpillar stage) in a field of fireweed on Haleakala Ranch. 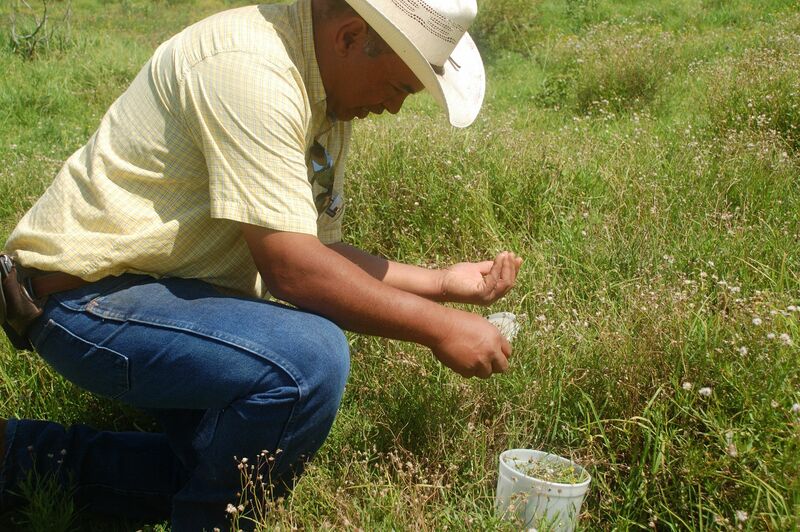 In addition, a total of 2,000 more larvae and moths were given to ranchers from 10 Maui ranches to release on their fireweed. In February, the first release of the fireweed moth was made on Kahua Ranch on Hawaii Island. More releases will continue on both islands. The Madagascan fireweed moth larvae voraciously consume the leaves specifically of fireweed plants, which is estimated to have taken over more than 850,000 acres of pastureland, mainly on Maui and Hawaii Island. It is believed that fireweed came to the islands in hydromulch material imported from Australia. The state approved the release of the moth in 2010, but also required approval of a federal permit, which was finalized by the U.S. Department of Agriculture on Dec. 6, 2012. 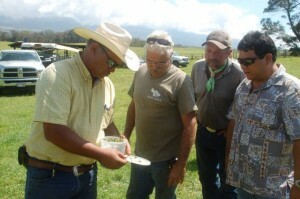 A rearing and release program has been developed in collaboration between ranchers, HDOA, and the University of Hawaii College of Tropical Agriculture and Human Resources. The program’s goal is to release large quantities of caterpillars and moths to help control fireweed. Present at today’s release were Maui ranchers Greg Friel (Haleakala Ranch), Annette Niles (Niles-Perreira Ranch), Gerard Thompson (Thompson Ranch), Joe Santos (Kaupo Ranch), Sydney Smith (Maliko Ranch), Jarett Sakamoto (Santos Ranch), William Jacintho (Naalae Beef), Mark Paris (ZD Ranch), and Jeff Alexander (Anuhea Ranch). Field of fireweed on Haleakala Ranch which makes this land unusable for cattle production. 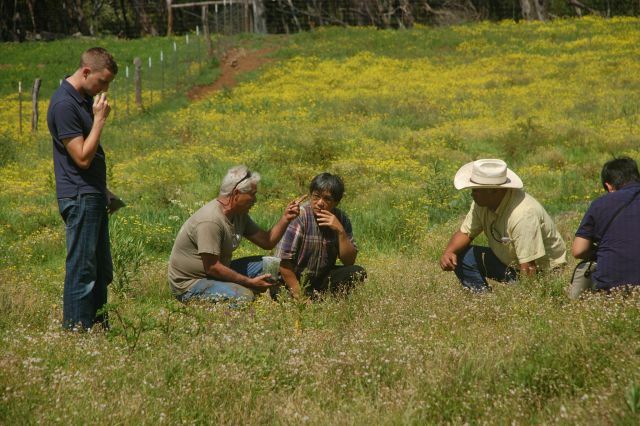 Maui ranchers Greg Friel (Haleakala Ranch), Jeff Alexander (Anuhea Ranch), Gerard Thompson (Thompson Ranch) and HDOA entomologist Darcy Oishi take a closer look at the fireweed moth larvae they are about to set free. Greg Friel releases the small fuzzy caterpillars. 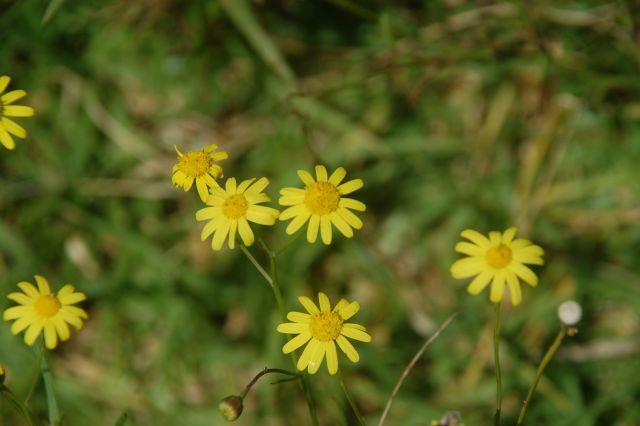 Such a pretty flower, but just a few ounces ingested can kill a cow or horse. 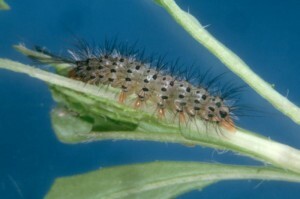 The fireweed moth caterpillars will gorge themselves on the fireweed. Entomologists say that like the monarch butterfly larvae which eats the poisonous crown flower, the larvae are unpalatable to birds, so birds will not eat them.